It’s been about a month since I started working out again (remember I had surgery in September, which meant I couldn’t do anything – literally – for about eight weeks). I got back on the exercise horse on Nov. 1. And since I promised to keep you up to date on how things are going on that front, here’s your next monthly update. Seen my BMI go from 25.2 (officially overweight) to 23. If you look at my numbers after month 1, you’ll notice that they’re not that different. I am not worried about that, because a) I didn’t work out for two months and when I started up again, had to do so gradually and b) as was inevitable, I slid off the healthy eating bandwagon a bit. So I’m actually pleased I’ve dropped the weight/inches I’d put on while I was “off.” And down a little bit from month 1 as well. 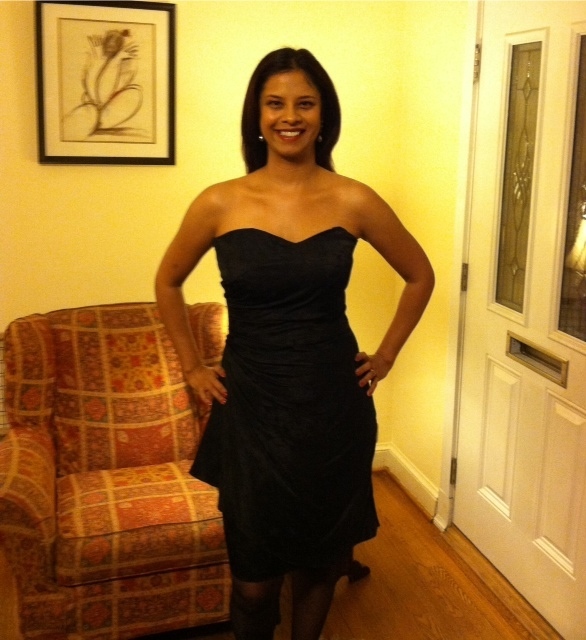 And you can see how happy I am with where I am right now in that photo up there, when I pulled out – and fit into – a little black dress I hadn’t worn since New Year’s Eve 2009, this past Sunday (we were headed to a fancy event). There are still things I can’t do, like run (which is ok since I don’t like to) and jump, because of lingering sensitivity from my surgery, but I’ll probably be able to start doing those in a month or two. But I am back to being able to plank (even one-handed! ), crunch, go deeper on the TRX, slam that firehose and squat like you wouldn’t believe it. Do I like how I look? Damn right I do. But more importantly, I like how I feel. I feel stronger, I feel more focused, which helps me with my work, and I feel more in charge of my health and my life. 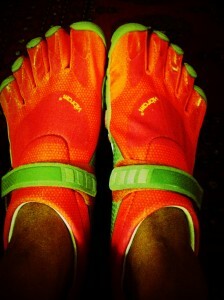 I’m becoming more adventurous, too; I bought a pair of Vibram minimalist shoes (they’re great!) and earlier this week, did my first workout in the rain. Believe me, I have never been the kind of person to do that, or to wear shoes that look like they’d be more at home atop a coral reef. I’m touched by the many notes of support people share with me, particularly in the Bootcamp Buddies group I started on Facebook (if you’re on a similar journey to wellness and would like to join, just let me know, it’s a wonderful support group). I’m touched by how all of you spur me on, and how encouraging you’ve been through this entire process. I’m touched by how patient my trainer, Grant Hill of MyBootcamp, has been. He never poo-poohs any discomfort I felt and is mindful of what my body still can’t do, yet pushes me a little more with every session. And I’m particularly touched that my husband, who came down to watch a training session with Grant last week, told me I was pulling “Rocky-like moves,” and is joining me on this adventure. We start our first partner session today! So thank you, and when you read my next update in about a month, hopefully I will have lost, and gained, more. In all the right ways.